This attractive and tasty drink is made by brewing dried hibiscus flowers as you would tea leaves. 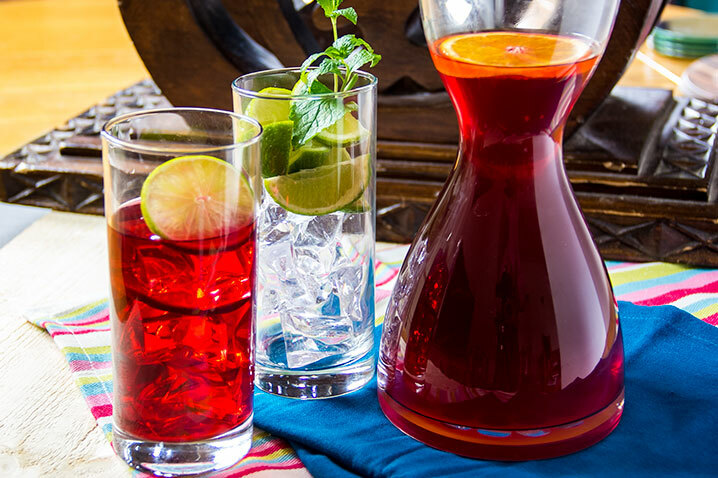 Sometimes known as bissap or sorrel it is enjoyed all over Africa and the Caribbean. This is how I enjoy it. Chilled and served with ice – it’s a perfect drink for a sunny afternoon. Sip slowly for that lazy holiday feeling. Dried hibiscus flowers can be found in African-Caribbean shops. Make the syrup by heating the sugar, 2 cups water, lemongrass and ginger in a saucepan and bring to the boil. Simmer and stir occasionally until the sugar dissolves. Simmer for 10 minutes or until the mixture becomes syrupy. Take off the heat and set aside to cool. Put the dried flowers in a separate pan. Boil the remaining water and pour over the hibiscus, cover and steep for 5-10 minutes. Strain the hibiscus water into a jug and stir in the lime juice. Remove the lemongrass and the ginger from the syrup, and add enough syrup to the jug to sweeten the drink. Chill and serve with ice. Keep the remaining syrup in the fridge for your next cool-down. No Replies to "Hibiscus Cool-down"